Ever since my husband slid a beautiful yellow gold ring on that special finger, I've been very particular with jewelry. Most of the time, my wedding ring is the only piece I wear. Before that, you'd see me with chunky sterling silver rings on 6 out of 10 fingers sometimes partnered with an equally chunky silver cuff bracelet. 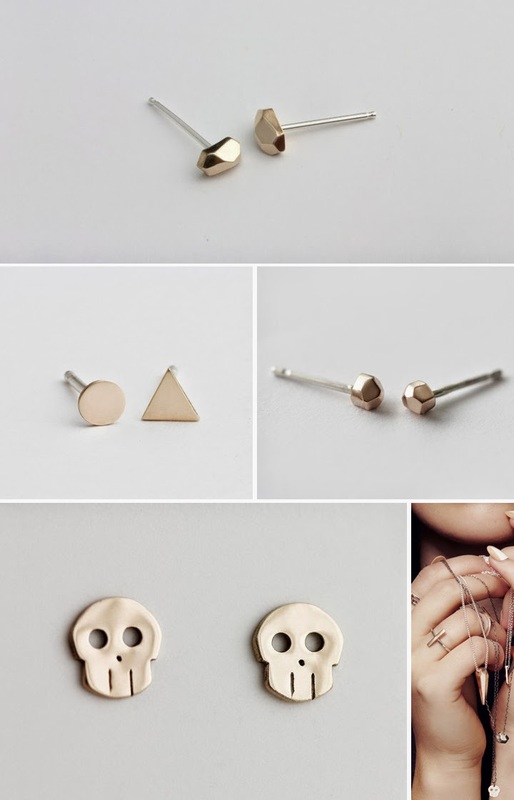 I still love those pieces, but now I learn towards minimal pieces in brass or yellow gold, like a simple necklace or minimal earrings. I've owned two pairs of earrings from Upper Metal Class (and I've posted about T's work on my blog before). Somehow I end up losing one. This time, I was rushing to put on my bar earrings at work and one dropped through the crack in the elevator threshold. Of course it fell right there. I had a few choice words. Now, I'm back to the shop to find another pair, and again finding it hard to decide. I like the idea of the mix-matched shapes. Or why not a skull?